Aim: Though different teaching learning media have been employed in the instruction of geriatric dentistry, their efficacy has not been adequately evaluated. This study was conducted with the aim to determine the efficacy of a PowerPoint presentation in teaching gerodontology. Materials and Methods: This is a prospective follow-up study using a pre- and post-intervention assessment. A pilot study was conducted on the final year students to check the feasibility of the study. A convenience sampling procedure was used. All interns (n = 80) of the Modern Dental College and Research Centre, Indore, India were invited to participate. Interns completed a 24-item questionnaire documenting their current knowledge on gerodontology. One week after a 30 min PowerPoint presentation on gerodontology, the same interns completed the same questionnaire again, providing an indication of the efficacy of the learning tool. Paired t-test and McNemar test were employed for statistical analysis. Results: A statistically significant difference was observed in pre- and post-intervention scores (P < 0.05). Conclusion: The results of this study indicated that PowerPoint presentation can be used as an effective tool for improving the knowledge regarding gerodontology. Among the teaching and learning methods employed in dental education, audio visual media are the most popular. These media provide a multisensory experience. The different senses tend to play a key role in improving the memory of the student who can easily remember the content that is presented. Efficacy of different media in the teaching and learning process of a specific subject of dentistry is not well-documented. Therefore, this study was undertaken to determine the efficacy of a PowerPoint presentation in teaching gerodontology to the dental interns. This is a prospective follow-up study using a pre- and post-intervention assessment. Ethical clearance was obtained from the institute to conduct the study. The duration of the study was from July 2012 to October 2012. A pilot study was conducted among 15 final year BDS students to find out the feasibility of the study and the questionnaire used was modified accordingly. A convenience sampling procedure was used. The study center was the Modern Dental College and Research Centre, Indore, India. All dental interns (n = 80) of 2012 batch were invited to participate in the study. Inclusion allowed for both genders, and all ages of interns. There was no exclusion criterion, besides unwillingness to participate. Written consent to participate in the study was taken. 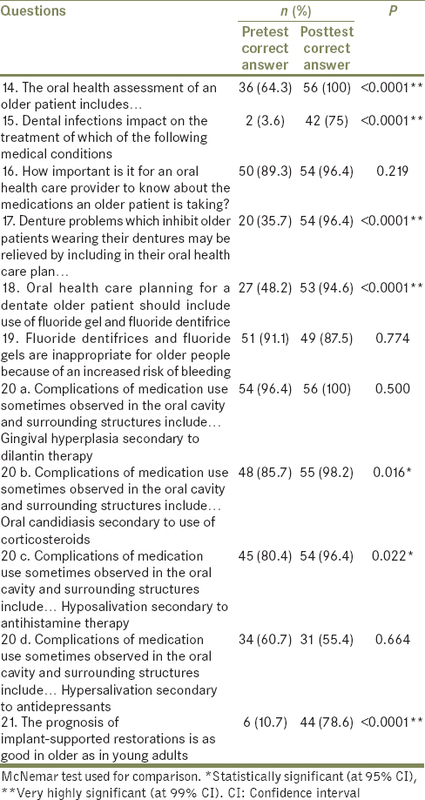 The study instrument used was a 24-item structured self-administered closed-ended questionnaire (options comprised of combination of multiple-choice true/false questions and single best answer questions) that was based on four domains measuring familiarity with geriatric dentistry and prior experience with "learning or teaching tools" (6 items); knowledge of characteristics of older people (7 items); knowledge of care provision (8 items); and barriers to and neglect of care provision (3 items). The questionnaire was adopted from Teasdale and Shaikh. and modified to suit the Indian context. All the interns were assembled in a classroom and were briefed about the study. They were asked to complete a preintervention questionnaire which took approximately 10 min. Afterward single investigator gave a 30 min PowerPoint presentation (Microsoft Office 2007) on gerodontology. The PowerPoint presentation comprised of information on educational tools, an introduction to ageing, effects of ageing on oral and systemic health, effects of systemic conditions on oral health of elderly population, oral side effects of medications, care provision, and challenges and barriers of geriatric oral health care. One week after the PowerPoint presentation, the same interns were recalled and requested to complete the same questionnaire again. Questionnaires were coded allowing paired analysis of alteration in the scores. Each "correct" answer to a question was awarded one point while an "incorrect" response was given zero. Questions that were not answered were given zero points. Questionnaires with overwriting were disqualified for analysis. The Statistical Package for the Social Sciences version 17.0 (SPSS Inc., Chicago, Illinois, USA) was used for all data analysis. Paired t-test was employed to find out the difference in overall scores that occurred before and after the lecture. McNemar test was used to find the improvement in correct answers for individual questions. Out of the 80 interns, 61 (76%) completed the preintervention assessment form and 56 interns (92% of those who answered the pretest) completed the postintervention assessment form, more female than male respondents. In the questions on general characteristics comprising of the geriatric age and the number of people in the 60-plus age group in India in 2013 the percentage of correct answers increased 1 week after the presentation. Regarding the question related to efficient learning or teaching tool there was no change [Table 1]a. In the question on rating oneself in terms of familiarity with gerodontology a substantial increase of those who considered "it had increased a lot" was found. Three quarters of the respondents agreed "a lot" to include gerodontology in the dental school curriculum after the PowerPoint presentation compared to only one-third before the test. No great changes were seen regarding the extent of training/experience including older patients after the test [Table 1]b. In the seven statements, 7-13, the posttest correct values improved for five questions [Table 2]. Among questions 14-21, the posttest correct values enhanced significantly in seven of the questions [Table 3]. In the seven statements 22-24 the posttest correct values improved significantly in three of them, whereas no significant change occurred for the other statements [Table 4]. The overall mean scores before the lecture were 18.5 ± 2.7, whereas the mean score posttest increased to 24.9 ± 1.9 showing a mean increase in score by 6.4 ± 2.8. This difference was found to be statistically highly significant [Table 5]. The percentage of correct answers before and after the lecture for "knowledge of characteristics of older people" was 68.6% and 87.5%; for "knowledge of care provision" the percentage improved from 60.2% to 87.9% and for "barriers to and neglect of care provision" the percentage increased from 82.4% to 92.1%. In all the domains, there was an increase in percentage of correct answers after the lecture. The increase in the population of aged individuals makes it relevant to include gerodontology in the dental curriculum. During the undergraduate dental education programme gerodontology is not given much importance although the student is expected to treat the elderly. Therefore, this study was undertaken to determine the efficiency of PowerPoint presentation in teaching gerodontology. When the first domain related to "general characteristics of older people" was considered 1 week after the presentation, all the graduates answered that the geriatric population includes 60 years and older individuals. 85.7% of graduates correctly answered that the number of people in the 60-plus age group in India is expected to increase to 100 million in 2013. 94.6% of the graduates rated audio visual aids as effective before the presentation. Graduates found themselves more familiar with gerodontology 1 week after the presentation. There was an appreciable increase in the number of graduates who felt that gerodontology should be a part of the dental school curriculum. The results of our study are in agreement with Shah; , Kalk et al. and Talwar and Chawla. A slight decrease in percentage was observed for extent of experience in treating older patients which could be due to the realization of their insufficient knowledge and experience after the presentation. 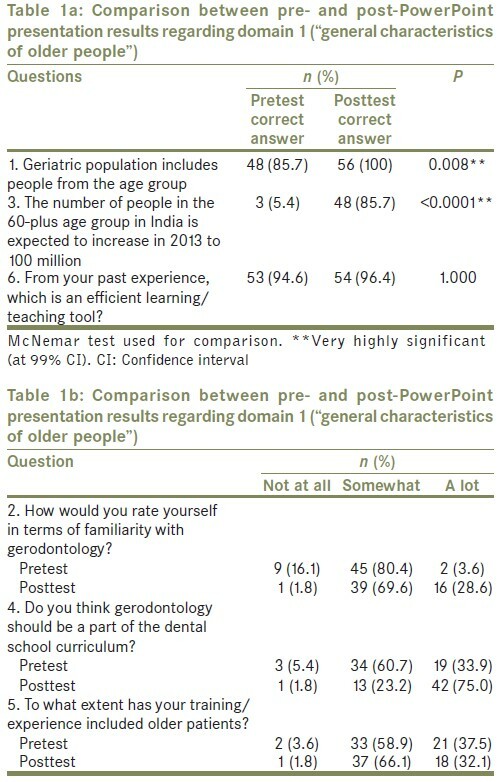 These findings are similar to those reported by Shah  that there is little emphasis on practical training of elderly in undergraduate dental curriculum in India. When the second domain "knowledge of characteristics of older people" was assessed 58.9% of the graduates knew that tooth loss is not an inevitable part of ageing. Awareness that elderly experience more injuries in the home improved among 85.7% of the graduates. Knowledge that the poverty rate of older people is higher improved in 83.9% of the graduates. The percentage of correct answers increased among 96.4% of the graduates when the responses were assessed for parents having problems adjusting to their "empty nest." One week after the presentation, 76.8% of the graduates knew that the edentulous older people when compared to dentate older people have a higher mortality rate. 85.7% of the graduates had prior knowledge that older persons who reduce their activities are not happier than those who remain active. This prior knowledge could be attributed to observation among grandparents or relatives. On assessing the third domain "knowledge of care provision" all graduates could answer regarding the aids used for oral health assessment of an older patient. 75% of correct answers were obtained for dental infections impact on the treatment of medical conditions. 96.4% correct scores were obtained for means to relieve denture problems. 94.6% scores were acquired for including use of fluoride gel and fluoride dentifrice in dentate older patients. Oral candidiasis secondary to use of corticosteroids and hyposalivation secondary to antihistamine therapy also showed 98.2% and 96.4% correct answers posttest. The PowerPoint presentation helped 78.6% of the graduates to understand that the prognosis of implant-supported restorations is as good in older as in young adults. 89.3% and 96.4% of the graduates were aware that it is important for an oral health care provider to know about the medications an older patient is taking and gingival hyperplasia secondary to dilantin therapy before the presentation. This awareness could be attributed to the similar finding among young adults. When the last domain "barriers to and neglect of care provision" was assessed it was found that all the interns (100%) knew the various barriers to oral health care provision and the predisposing factors related to opportunistic infection of Candida albicans. 96.4% graduates knew the consequences of neglect of oral health. All graduates knew that periodontal disease may be caused by neglect of oral health. This awareness may be as these sequelae are commonly observed. There was an overall increase in the posttest scores 1 week after the presentation. The results of our study are in agreement with Teasdale and Shaikh. who also reported significant improvement in test scores after use of a compact disc based educational tool. According to a study conducted by Parolia et al. the use of diagrams and symbolic devices such as graphs, flow charts, and arrows help students to understand the topic better. An overall comparison of all the domains revealed an improvement in knowledge in each of them which could be attributed to the use of audio visual aids. The results support Mayer's cognitive theory of multimedia learning  according to which when learning we place relevant words into auditory working memory and relevant images into visual working memory. This information is then integrated as one along with the prior knowledge. The least preintervention scores were obtained for the domain "knowledge of care provision" which may be due to gerodontology not being given sufficient importance in the undergraduate curriculum. This finding is similar to that reported by Shah  that there is no orientation of dental graduates toward the special needs of the geriatric. Limitations of the study were small sample size; limited time gap between pre- and post-test and between the lecture and the posttest (where a longer gap would help assess longer-term retention of knowledge). The same questions were given in the pre- and post-tests, so students might have had the opportunity to look up answers from another source other than the PowerPoint before the posttest. If so the PowerPoint presentation had an additional advantage of stimulating the interest of the students. Therefore, the results may be biased toward finding a greater effectiveness of PowerPoint than there actually is. In this study, PowerPoint presentation proved to be an effective tool for teaching. In other instances alternative techniques may be effective, so it is best to test these before implementation. The authors would like to acknowledge Dr. Gunnar Carlsson and Dr. Cees de Baat for inputs in preparing the questionnaire; Dr. Saran Shantikumar and Dr. Gouri Anehosur for inputs in the manuscript and Dr. Vikneshan M, Department of Public Health Dentistry for conducting the statistical analysis. Shah N. Geriatric dentistry: The need for a new specialty in India. Natl Med J India 2005;18:37-8. Available from: http://www.mospi.nic.in/mospi_new/upload/elderly_in_india.pdf. [Last accessed on 2015 Jul 22]. Nadig RR, Usha G, Kumar V, Rao R, Bugalia A. Geriatric restorative care - the need, the demand and the challenges. J Conserv Dent 2011;14:208-14. Park K. Park′s Textbook of Preventive and Social Medicine. 20 th ed. Jabalpur: Banarsidas Bhanot Publishers; 2009. p. 447-525, 757-70. Dounis G, Ditmyer MM, McClain MA, Cappelli DP, Mobley CC. Preparing the dental workforce for oral disease prevention in an aging population. J Dent Educ 2010;74:1086-94. Srivastava R, Nongkynrih B, Mathur VP, Goswami A, Gupta SK. High burden of dental caries in geriatric population of India: A systematic review. Indian J Public Health 2012;56:129-32. Fabiano JA, Waldrop DP, Nochajski TH, Davis EL, Goldberg LJ. Understanding dental students′ knowledge and perceptions of older people: Toward a new model of geriatric dental education. J Dent Educ 2005;69:419-33. Helgeson MJ, Smith BJ, Johnsen M, Ebert C. Dental considerations for the frail elderly. Spec Care Dentist 2002;22 (3 Suppl): 40S-55S. Petersen PE, Yamamoto T. Improving the oral health of older people: The approach of the WHO Global Oral Health Programme. 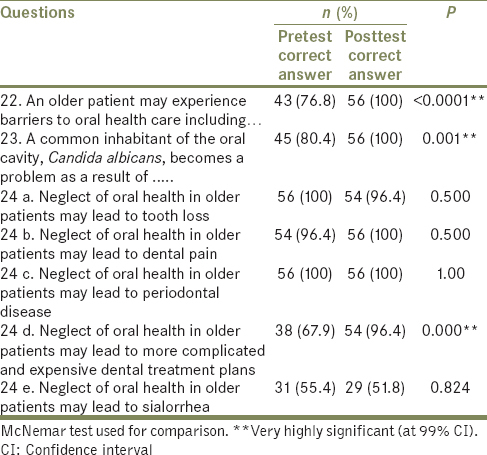 Community Dent Oral Epidemiol 2005;33:81-92. 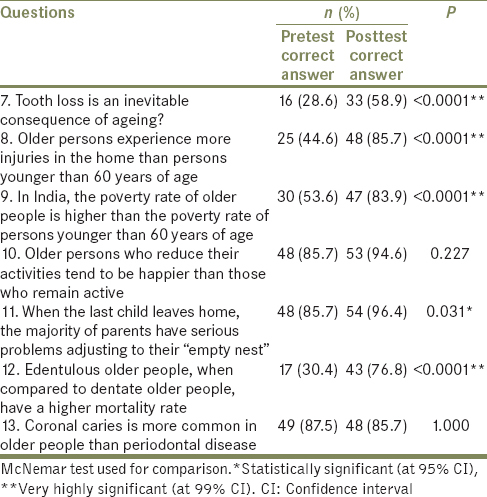 Shah N. Geriatric oral health issues in India. Int Dent J 2001;51 (3 Suppl): 212-8. Mohammad AR, Preshaw PM, Ettinger RL. Current status of predoctoral geriatric education in U.S. dental schools. J Dent Educ 2003;67:509-14. Issrani R, Ammanagi R, Keluskar V. Geriatric dentistry - Meet the need. Gerodontology 2012;29:e1-5. Kalk W, de Baat C, Meeuwissen JH. Is there a need for gerodontology? Int Dent J 1992;42:209-16. Talwar M, Chawla HS. Geriatric dentistry: Is rethinking still required to begin undergraduate education? Indian J Dent Res 2008;19:175-7. Sande AR, Suragimath A, Bijjaragi S, Mathur A. Geriatric dentistry in India: An oral medicine perspective. J Indian Acad Oral Med Radiol 2014;26:298-301. Available from: http://www.dciindia.org.in/Rule_Regulation/BDS_Course_Regulation_2007_alongwith_Amendments.pdf. [Last accessed on 2015 Jul 22]. Shah N. Teaching, learning, and assessment in geriatric dentistry: Researching models of practice. J Dent Educ 2010;74:20-8. Kossioni AE, Karkazis HC. Development of a gerodontology course in Athens: A pilot study. Eur J Dent Educ 2006;10:131-6. Mendoza-Núñez VM, Martínez-Maldonado Mde L, Correa-Muñoz E. Perceptions on the importance of gerontological education by teachers and students of undergraduate health sciences. BMC Med Educ 2007;7:1. Thomas S. The need for geriatric dental education in India: The geriatric health challenges of the millennium. Int Dent J 2013;63:130-6. Kimbrough VJ, Henderson K. Oral Health Education. Upper Saddle River, NJ: Pearson/Prentice Hall; 2006. p. 39-51. Teasdale TA, Shaikh M. Efficacy of a geriatric oral health CD as a learning tool. J Dent Educ 2006;70:1366-9. Meyur R, Mitra B, Adhikari A, Mitra D, Biswas S, Sadhu A. Attitude of medical students about different teaching aids used in lectures in anatomy. Nepal Med Coll J 2011;13:157-9. Parolia A, Mohan M, Kundabala M, Shenoy R. Indian dental students′ preferences regarding lecture courses. J Dent Educ 2012;76:366-71. Bartsch RA, Cobern KM. Effectiveness of PowerPoint presentations in lectures. Comput Educ 2003;41:77-86. Tang TL, Austin MJ. Students′ perceptions of teaching technologies, application of technologies, and academic performance. Comput Educ 2009;53:1241-55.